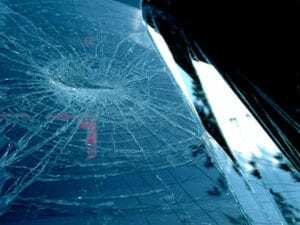 When a windshield cracks, the methods for fixing it depend on the size of the damage. If your windshield has a small crack or chip there is a good chance that is can be repaired. However, sometimes windshield replacement is the only option, especially in the case of larger breaks. Most windshields can be replaced in as little as two hours. Our windshield replacements are done with OEM glass. Original Equipment Manufacturer (OEM) glass is produced by the same factories automakers use. An OEM windshield will be identical to the original, factory installed windshield that came with your car when it was brand new. The Jiffy Auto Glass team of certified technicians prefers OEM glass, and our skilled installation professionals guarantee a perfect fit every time. Windshield glass is made of Laminated Safety Glass which is a special type of glass. Laminated glass is made up of two pieces of glass with a thin layer of vinyl in between. This special design provides optimum safety in the event of a collision. If you don’t have the time to wait for a windshield replacement, our mobile windshield service can come to you! We serve customers from Colorado Springs all the way to Fort Collins. We offer free same day or next day mobile windshield replacement to Boulder, Denver, Ft. Collins, Greeley, Colorado Springs, Loveland and all areas surrounding those towns. When you choose Jiffy Auto Glass, you will always get a lifetime warranty and hassle-free service. Jiffy Auto Glass only uses the highest quality OEM automotive glass and adhesives. All work is performed by a Jiffy Certified Glass Technician, and our workmanship is guaranteed for life. We don’t cut corners, and we stand by every vehicle we service. All our work is covered by our Jiffy lifetime guarantee. At Jiffy, serving you is our number one priority, and your complete satisfaction is our number one goal. Call us and see for yourself why Jiffy is the area’s fasting growing auto glass company. Contact Jiffy Auto Glass Colorado today to get an accurate time estimate and quote on your windshield replacement.